The Kinetic art shocked the art world with its revolutionary concept of motion. From its early stages until its peak, several kinetic masterpieces still left the public in awe for their intricate design. Here are some of the most popular and significant Kinetic art. Marcel Duchamp was the man behind the Bicycle Wheel. He called his artworks ‘readymades’ which was intended as generally mass-produced objects, placed in galleries, and presented as works of art. Duchamp placed the bicycle wheel as part of his artwork. This art piece contains a movable object and thus the first example of Kinetic art. 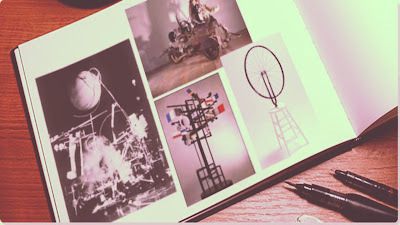 However, Duchamp was first associated with the Dada movement and the ‘Bicycle Wheel’ is a significant expression of the revolutionary concept of the movement; it pushes the boundaries of the art subject and establishes notions of artistic interpretation. Dada movement comprises of artists who defies any reason, logic, and aestheticism. Instead, Dadaism expresses irrationality, nonsense subjects, and anti-bourgeois protests in its artworks. However, when Duchamp incorporated the bicycle wheel movement, it’s a significant piece in incorporating movement in an artwork. Duchamp described this essential artwork as a very enjoyable experience for him and compared his artwork as ‘flames dancing in a fireplace.’ The first people who viewed the Bicycle Wheel were invited to spin the wheel and Duchamp created more proto-Kinetic artworks like his Rotary Glass Plates or Precision Optics in 1920 and Roto-Reliefs in 1935 to 1965. Although Duchamp did not intend his Bicycle Wheel as part of the Kinetic art movement, succeeding artist of the 1950s and 1960s refer to his work as a precursor of the tradition Kinetic art. Most Kinetic artists experimented with the interrelationship of technology and humanity. Years after the release of Bicycle Wheel, Naum Gabo launched his first Kinetic art piece entitled Kinetic Construction or more commonly known as Standing Wave. His art piece consists of a vertical steel rod affixed to a wooden base and activated using an electric motor. The rod creates an illusion of static yet curvilinear shape which formed entirely through movement. Many consider Standing Wave as the first Kinetic art made intentionally for its purpose. Gabo made this sculpture in Moscow at the height of war-torn post-Revolutionary period. During that time, Russian artists were attempting to play their part in the construction of a new Utopian society. Kinetic Construction was made as a good example of the certain wave-forms moving through space to create an illusion of permanent and static presence. Gabo’s masterpiece pertains to the political, radical and technological view of Constructivism works of Kinetic art. Famous artists of the 1950s and 1960s tried to revive the technological and conceptual idea of Constructivist, creating a relationship between technology and art. Gabo’s standing wave represented the beginning of the Kinetic art era, for him Standing Wave is an "explanation of the idea than a Kinetic sculpture itself". The Arc of Petals played as one of many good examples of free-standing ‘mobiles’ of which the sculptor Alexander Calder became famous for. He came from a family of prominent painters and sculptors before training as an artist. He took a degree in mechanical engineering an important skill in manipulating technical process needed in the Kinetic art. The artworks resemble an inverted, suspended tree and comprise of the central spine of iron wire with different petals. The Arc of Petals sways with the wind, expressing the viewer’s interpretation of heaviness and lightness with each irregular pattern of movements. In creating such artworks, Calder defined a sub-genre of Kinetic aesthetics – one that is concerned with movement rather than the mechanized, modern world. Before his Arc of Petals, Calder was already known for creating mobiles set in motions using air currents. He used to create artworks using materials like pottery or glass. But he used a different medium of hand-crafted aluminum painted in different colors such as yellows, blues, blacks, and whites in creating Arc of Petals. Because of his unique works and great feat in producing Kinetic art pieces, he made an influence on several artists like Joan Miró and Jean Arp. They used painted aluminum petal and intentionally left several in the presentation the roughness and weight of the materials used. Having these early artworks of Kinetic art, it did not become a prominent art form until 1955. The group exhibition called Le Mouvement held at the Galerie Denise René in Paris. The exhibits main event was an artwork made by Victor Vasarely entitled “Manifeste Jaune” or Yellow Manifesto, which uses black and white colors arranged in grids that suggest depth or motion. It quickly attracted the public eye as well as other artists across the globe. Kinetic art soon becomes a prevalent art form for almost a decade.